Montreal has long been considered Canada’s cultural capital and may very well be one of North America’s most beautiful and interesting cities. It is warm and inviting, as well as multicultural and cosmopolitan. French is the city’s official language, creating the illusion that Montreal is more of a European than North American city. Montreal may be best known for hosting the “Just for Laughs Comedy Festival” and for its beloved hockey team, the Montreal Canadians. However, in recent years it has re-established itself as a true boxing hotbed. Historically, Montreal has always supported the sweet science. In 1958, arguably one of the greatest title fights of all time took place in Montreal between Yvon Durelle and legendary champion, Archie Moore. Moore eventually defeated the French Canadian, but it wasn’t easy. Motivated by fighting in front of a home crowd, Durelle, a 4-1 underdog, managed to knock down the champion five times before being stopped in the eleventh round. Montreal also hosted the first Sugar Ray Leonard – Roberto Duran fight in 1980 in front of 44,000 spectators. Those numbers are truly amazing when you consider that neither boxer was fighting in front of a home crowd. Both the American, Leonard, and the Panamanian, Duran, were fighting on foreign soil. Montreal fans were not there to support one of their own as they had for Durelle years earlier. They were supporting the sport of boxing itself. That support has always existed in Montreal and now the rest of the world is taking notice. American fighters, who would never have considered leaving home in the past, are now gladly flocking to Montreal and Quebec City to ply their trade in front of knowledgeable and appreciative audiences. Over the last few years, world ranked American boxers such as, Bernard Hopkins, Chad Dawson, Timothy Bradley, Kendal Holt, William Joppy, and Omar Sheika, as well as American-based fighters Edison Miranda, Glen Johnson, and Librado Andrade have all fought in the province of Quebec. Ironically, after Bernard Hopkins fought Jean Pascal to a controversial draw in Quebec City in 2010, he swore he would never again fight in Canada. Funny how interest and money can change the mind of even the harshest critic. Bernard Hopkins did travel back across the border, this time to Montreal, and proceeded to win his rematch with Jean Pascal, becoming the oldest boxer in history to win a world title. More than 17,750 tickets were sold for the fight. Compare that to his very next fight against Chad Dawson at the Staple Center in Los Angeles, in front of a considerably smaller crowd of 7,000, and one can’t help but see the growing potential of the Montreal market. How did the Montreal faithful react to the defeat of their local hero Jean Pascal? They responded with class. At the end of the fight, not only did the fans continue to support Pascal, they also enthusiastically applauded Hopkins and acknowledged his monumental performance. It is the capacity that the Montreal fans possess to judge fighters solely on their merits that makes coming to Montreal so inviting. This attitude transcends boxing. Though the Quebec fans are fiercely loyal and incredibly supportive of their own, what makes them truly special is that you don’t need to be French Canadian to be loved. If you adopt them they will in turn adopt you. Before baseball legend Jackie Robinson broke the color barrier in Major League Baseball, he played in the International League for the Montreal Royals. He often spoke about how fortunate he was to play baseball in Montreal because all that was expected of him was to play to the best of his ability. “In my own country, I received boos and jeering. Going back to Montreal, and the warm and friendly reception that I received, is something I can never forget.” After Montreal won the International League Championships in 1946, the Montreal Gazette reported that Robinson was forced to run for his life because he was being chased by white men – not because of hate but because of love and adoration. Montreal’s love affair with its athletes, either homegrown or adopted, is as strong now as it was in the days of Jackie Robinson. Just ask Lucien Bute, the former Super Middleweight Champion of the world. Bute was born in Galati, Romania in 1980 and arrived in Montreal in 2003 to work as a training partner for local fighter Eric Lucas, who was preparing to defend his WBC Super Middleweight Title against Markus Beyer. Since his arrival, Bute has become a fixture in the Montreal boxing scene. 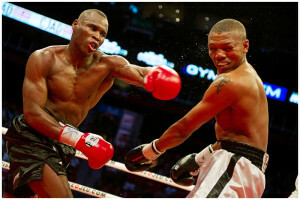 On October 19, 2007, at the Bell Center in Montreal, Bute was given a shot at the IBF Super Middleweight Title. He defeated Alejandro Barrio of Columbia by TKO in the eleventh round. Bute went on to defend his title nine times, including six title fights in Montreal. His title reign ended in 2012, when he was soundly defeated by Carl Froch in Nottingham, England. In 2014, after a long lay off due to injuries, Bute was matched against fellow Montreal resident Jean Pascal. Despite the fact that both fighters were no longer world champions, the fight captured the interest of the entire city and proved to be their best financial option. More than 20,000 boisterous fans took turns chanting the names of their hometown heroes throughout the entire twelve-round match. When it was all over, Pascal was awarded a unanimous decision over his cross-town rival. Montreal boxing promoter, Yvon Michel, claims that there are numerous reasons for the consistent success of boxing in the Montreal market. For one, the city has never been short of homegrown talent. Hall of Famer, Arturo Gatti was raised in Montreal and went on to become the WBC Lightweight Champion. Two of the four Hilton brothers, who were as famous in Montreal for their antics outside the ring as inside, managed to stay out of trouble just long enough to win world titles. Matthew Hilton was an IBF World Light Middleweight Champion back in 1990 and his brother Davey Hilton Jr. won the WBC Super Middleweight Title in 2000. Another set of Montreal brothers, who are still making their living in the fight business, are Howard and Otis Grant. Back in 1998, Otis Grant challenged Roy Jones Jr. for his WBA and WBC Light Heavyweight Titles. He and brother, Howard, a former Olympic boxer, now run a popular gym in Montreal with clients from both the boxing and MMA world. For years, they have coached UFC fighter Georges St. Pierre and were Lucien Bute’s corner men. Montreal resident Eric Lucas held the WBC Super Middleweight Title from 2001 – 2003 and was a regular main event fighter at the Bell Centre. Dierry Jean, of Montreal, fought Terence Crawford in 2015, for the WBO Light Welterweight Title but was stopped in the tenth round. Former WBC heavyweight champion, Bermane Stiverne, grew up and learned his trade in Montreal. WBC Champion Adonis Stevenson has fought most of his fights in Quebec and has seen little reason to fight elsewhere. Whenever he steps into the ring at the Bell Center, the arena is packed. In 2015, Montreal native David Lemieux lost his IBF Middleweight Title to Gennady Golovkin. Despite the loss, Lemieux endeared himself to his Montreal fans by seeking out Golovkin and challenging the fighter that most others in the division were trying to avoid. Although Golovkin proved to be too much, Lemieux demonstrated that he was both willing and brave. At one point, Lemieux was hit while taking a knee. He shook it off and said nothing. If ever a fighter was looking for an easy way out, that was it. He could have easily made the claim that the illegal blow prevented him from continuing. Had he done so, he may have been awarded the fight by disqualification. Thankfully, that’s not what Montreal fighters do, nor is that what Montreal fans expect. Lemieux didn’t look for a way to earn an undeserved victory. Instead, he tried his best but came up short. His Montreal fans knew what he was up against in Golovkin and despite the loss, admiration and support for Lemieux has only grown. According to Yvon Michel, Montreal is a city that supports all sporting events. Montreal’s athletes are seen as celebrities and boxing matches are seen as social events. He remembers seeing thousands of fans turning out to support Quebec’s Amateur Olympic Athletes in sports like speed skating and synchronized swimming. Being world class and representing Quebec has always been enough to elicit both pride and support from the Quebec faithful. Another reason for boxing’s success in Montreal is the ability for promoters to work together. Yvon Michel and rival promotional company, Eye of the Tiger, see the benefit of working together in order to make the best match-ups possible. As a result, Montreal fans are never sitting around wondering what would have been. Matches that are hoped for are made. The two biggest promotional companies understand the principles of mutual prosperity and mutual benefit. They work together because when they do, all of Quebec benefits – the promoters, boxers, fans and the media. Unlike the majority of big city newspapers that never seem to cover any boxing news, Le Journal de Montreal dedicates an entire section of their online paper to covering boxing and other combat sports. Former champions, Pascal and Bute are no longer the stars of Montreal as they once were. Both are now on the brink of retirement. Pascal has lost three of his last five fights, while Bute has lost four of his last five. For both men their best days are behind them. However, their contribution to the Montreal boxing scene will never be forgotten. Montreal fans are not fair weather fans. If Lucien Bute and Jean Pascal never win another fight, they will still be forever loved by the city of Montreal. Despite the fact that Bute and Pascal are on the way out, the future of boxing in Montreal will continue to shine for years to come. Three of the Ring’s “100 Best Fighters in the World” call Montreal home; Adonis Stevenson, the WBC light heavyweight champion, undefeated light heavyweight Artur Beterbiev, and undefeated Eleider Alvarez, also a light heavyweight. Rumors in Montreal are suggesting that Eleider Alvarez, a Montreal resident by way of Colombia, will be challenging Montreal resident and WBC Lightweight Champion, Adonis Stephenson for his title in Montreal in early 2018. The fight was originally rumored to be held in December but has been moved back because one of Montreal’s other top tier fighters is already in negotiations to fight at the Bell Center in December. David Lemieux appears to be set to take on WBO Champ Billy Joe Saunders just before Christmas. Promoters in Montreal are living the dream. When the main event fighters are from the host city and are vying for a world title, tickets tend to sell themselves. As in all things in life, success seems to keep opportunity flowing. Whoever wins between Alvarez and Stephenson will probably guarantee themselves main event status in Montreal at least for the next couple of years. Perhaps, Sergey Kovalev who has fought twice in Montreal would be willing to come back to chase a title? Should David Lemieux defeat Saunders that could open up a number of possible match ups. In the past, Lemieux has called out Canelo Alvarez and appears willing to step in against anyone at anytime. Artur Beterbiev has also announced that he is ready to challenge for a world title as soon as possible. Besides the major fights held at the Bell Center a large number of smaller cards are held annually throughout Montreal. Montreal trained fighters such as, Yves Ulysse Jr., Steven Butler, Batyr Jukembayev, Oscar Rivas, and Custio Clayton are all hoping to keep the Montreal tradition alive by one day becoming world champions.